In the following tutorial we’ll teach you two excellent methods to reset Android on your Acer Liquid Z2 and thus regain factory settings status, leaving your Acer phone in a fresh state. If you have “working” access into your Acer Liquid Z2 settings menu, please review our first method. If your Android operating system is corrupt or you have a lock pattern placed in your Acer Liquid Z2 phone that you do not remember, then the second method is for you. You only need to navigate into the following menu: Settings > Backup and Restore > Factory data reset > Reset phone > Erase everything. After a few moments the Acer Liquid Z2 will reboot into it’s initial user data routine, in factoy fresh mode. 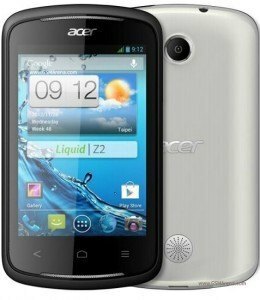 The advantage of this method is that the final screen will prompt you to format the SD memory in the Acer Liquid Z2, in this case if you do not reformat your data stored there will remain . Press the VOLUME DOWN and the POWER buttons at the same time and do not release them. The phone will enter into recovery mode menu. Choose RECOVERY. You can use VOLUME UP button to move and select the option with VOLUME DOWN. Do the same on the next screen when you see ” Yes – Delete all user data” , then wait for the process to take place.